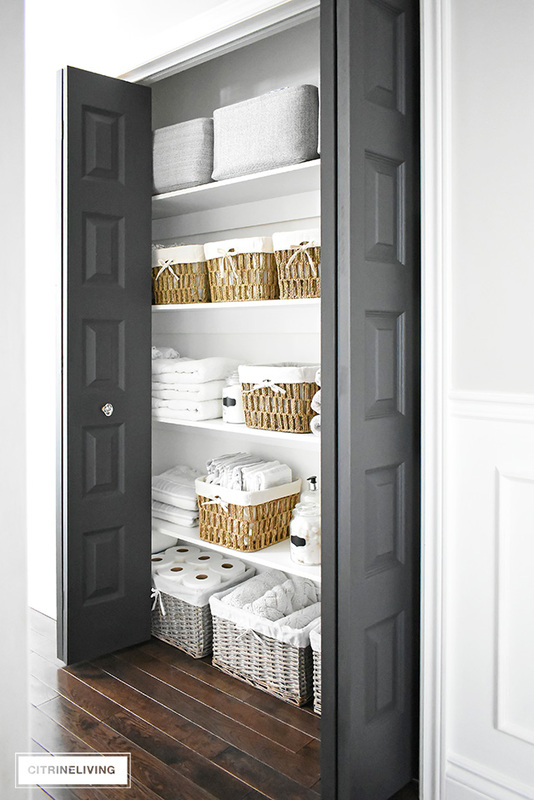 Making your home Summer-ready is really such an easy thing to do. 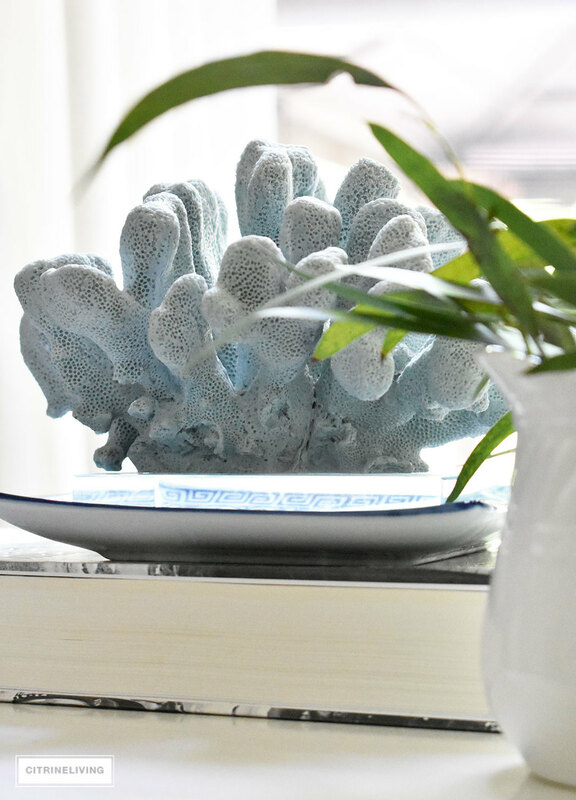 I used a few basic ways that you can also use to infuse the relaxed vibe of season into your home. 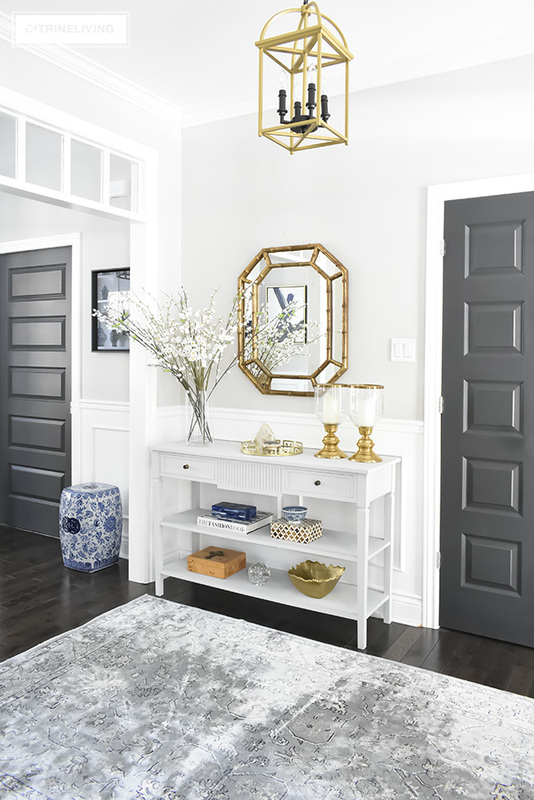 If you’re joining me from Kathleen of Lindsay Hill Interiors, welcome! Don’t you just love her Summer home? Everything Kathleen does is so inspiring! I’m very happy to have you here and I hope you enjoy your visit and stay a while! I’m sharing links to all of the fabulous bloggers on this tour, at the bottom of my post, make sure to look for them! 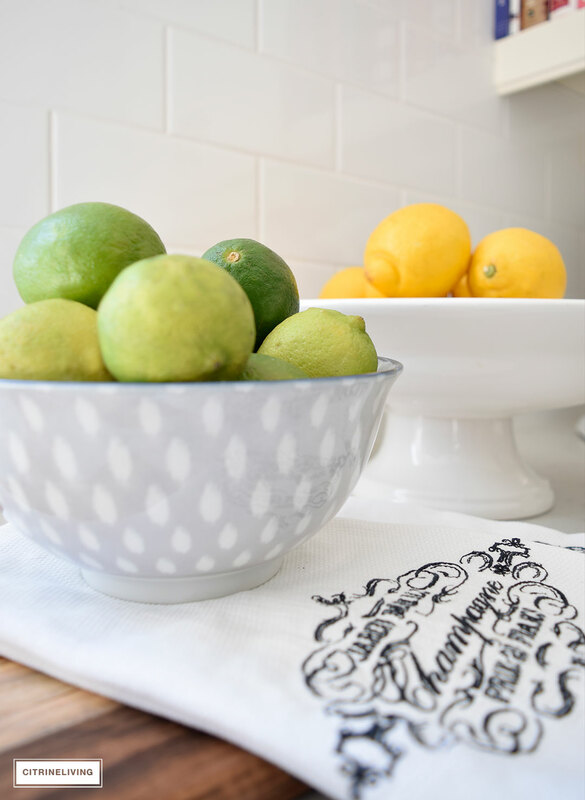 Today I’ll be sharing simple Summer decorating tips that anyone can use, no matter what your decorating style may be. 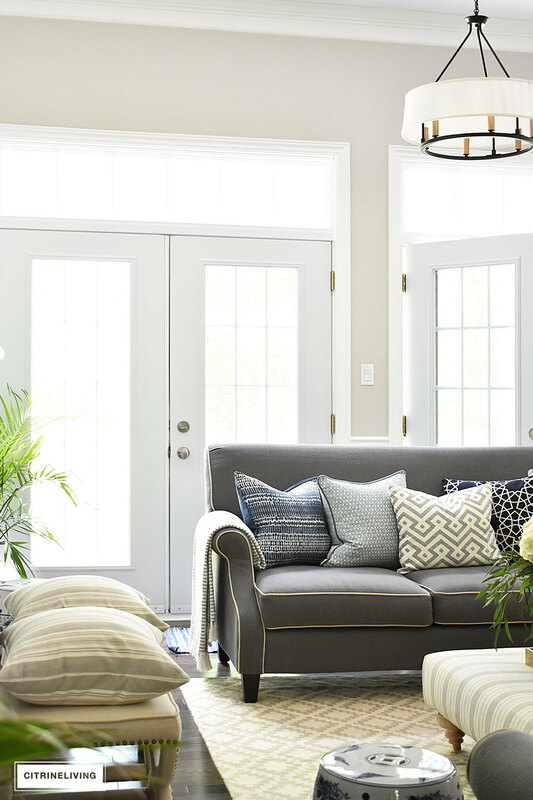 If you’re a regular reader, you may have already picked up on some of these tips with my two most recent blog posts – Summer Home Tour : here and my latest obsession, Stripes : here. I’ll be looking a little closer at some details with you today, so sit back, relax and enjoy reading! Today I’m continuing the conversation about adding stripes for the season. In the above and below images, I’ve incorporated striped runners in the living room and kitchen. Here’s the catch – they’re not even runners at all and I have the easiest DIY tip ever to share with you. I’ve used different striped textiles in a variety of ways. 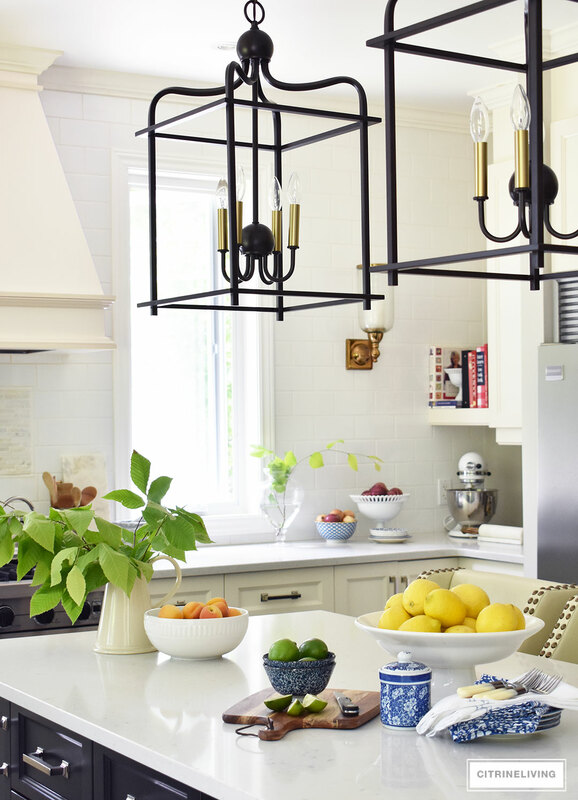 Blankets and turkish towels with tassels are currently on-trend and a favorite of mine, and when layered with another pattern or stripes, it provides that casual feeling of Summer we all crave. Below is my Spring porch with a little al fresco snack station. You can read this post here. 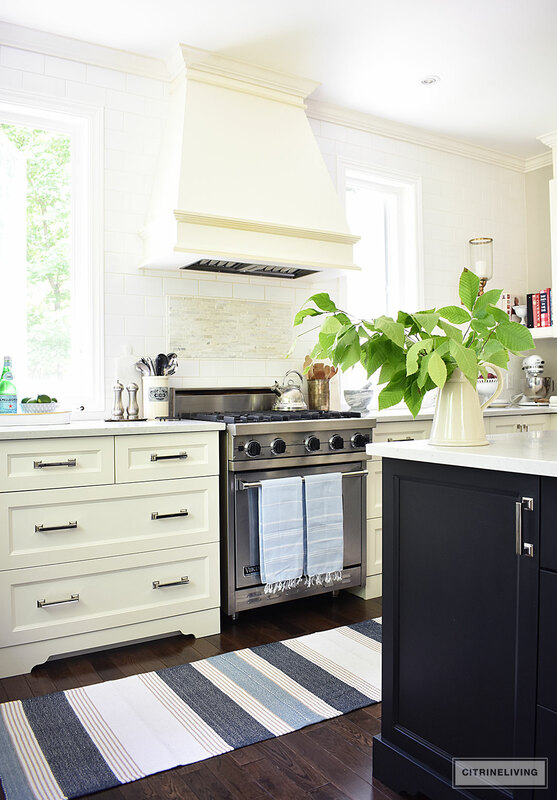 SHOP RUGS AND TURKISH TOWELS BELOW. CLICK THE BOTTOM OF THE THUMBNAIL TO VIEW THE PRODUCT. Lemons and limes happen to be my favorite. In the image above I’ve paired them with the deep, rich tones of the blueberries and blackberries for this casual tablescape. You can see more of this table here. 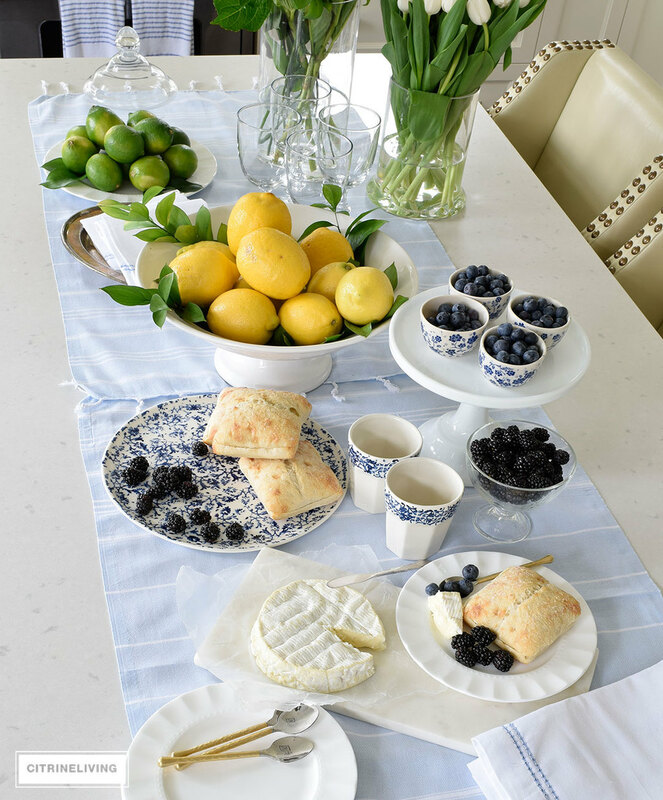 By the way, do you notice the Turkish towels used as a table runner? 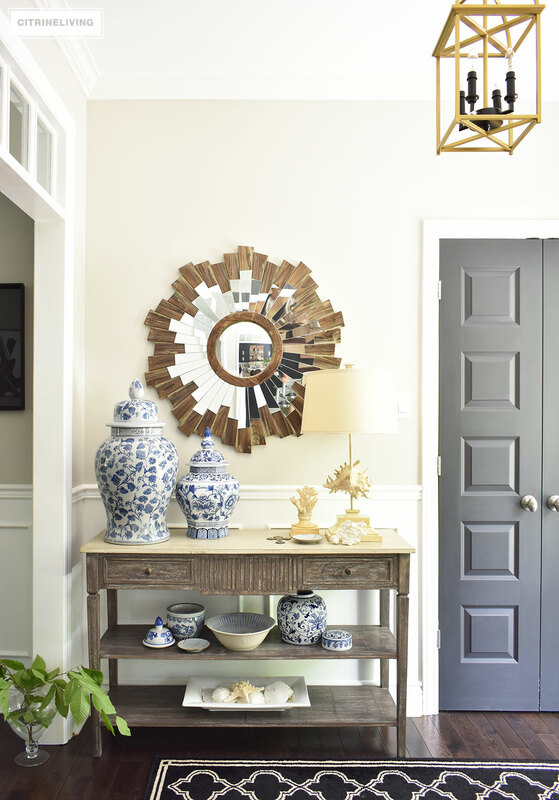 Be creative and find multiple ways to use pieces like these around your home! I love to use starfish, shells and agate around our home for the season as well. 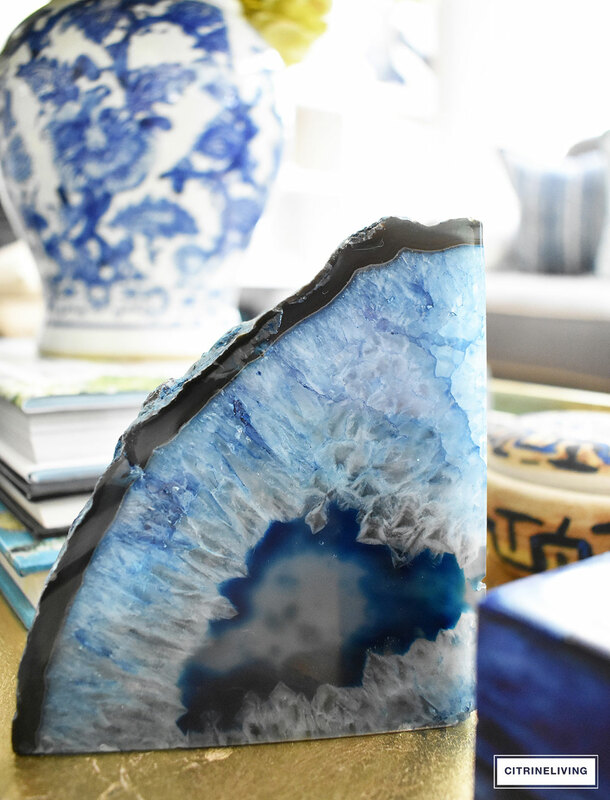 Natural curiosities always bring an elevated look to any space. They’re elegant and refined, but also relaxed. The textures and colors add another layer to a vignette and they’re always interesting to look at, with their textured surfaces and interesting shapes. I use both real and faux around our home. 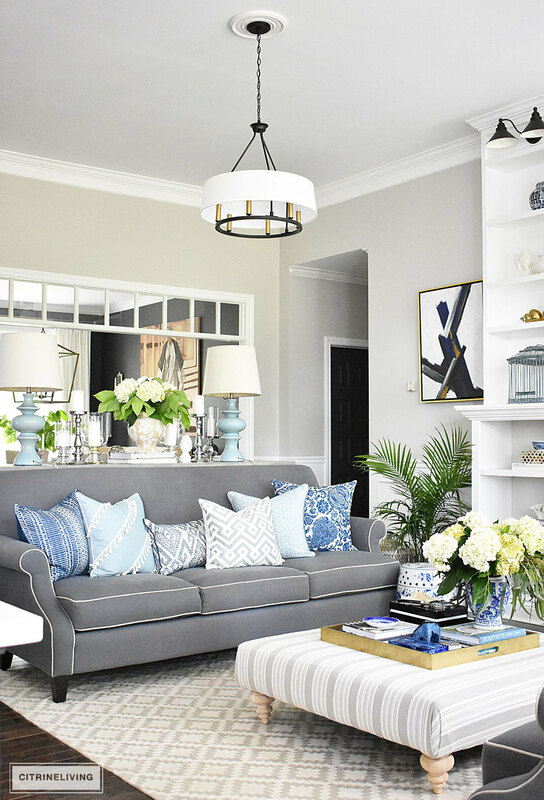 Layers and layers of pattern and texture are a key focus in our living room, and by using a very focused color palette of blues and neutrals, I was able keep the look from getting too overwhelming. Stick to one to three colors to keep the look more restrained. You can vary the shades within those colors, as I have here. I’ve used blues (the dominant color and my favorite) , greys and whites/creams. Mix multiple colors for a more energetic vibe. A general decorating tip, is to try to repeat your use of color somewhere else in the room as well, to create visual balance in your space. We have an open concept home, so I often use this basic principal throughout, to create cohesion. Thanks for stopping by and taking the time to look a little closer at my Summer decor this season. 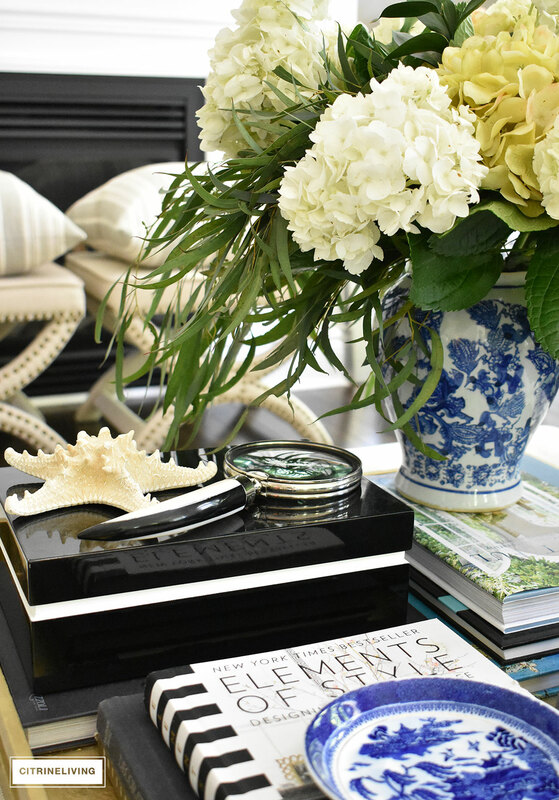 I hope you found some useful tips to incorporate into your home for the Summer! 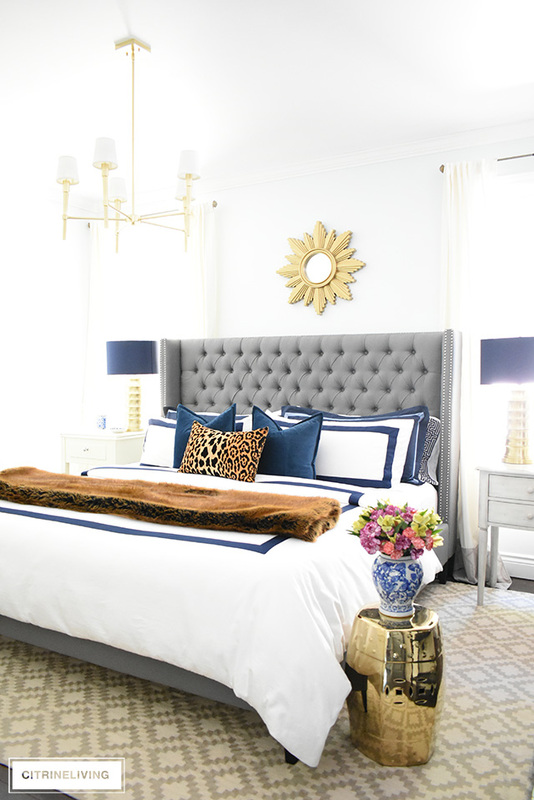 Next on our tour is Lizbeth from HOME AND FABULOUS – you’ll love her beautiful Summer home tour and her chic and glamorous style! Don’t forget to visit everyone on the tour, listed below! « STRIPES, STRIPES, STRIPES AND MORE STRIPES! Such an amazing play of patterns! Classic elegance! Beautiful seasonal accents – I love it all, Tamara! And you’ve elevated stripes to a whole new design level. So pretty. I love your gorgeous pillows. Wowwwww Tamara! You know your home is one of my favorites! I love it, simply beautiful! loving all the pattern play Tamara especially on the sofa! love your gorgeous home. So elegant and comfortable at the same time. Thank you so much Amie!! That means a lot to me! Can’t wait to check out your lakehouse tour! 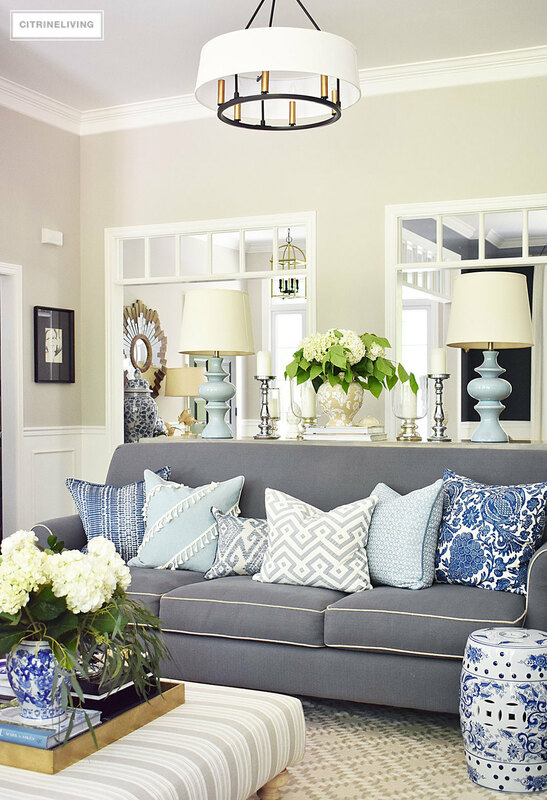 Tamara, your house is so pretty, and the blue and white that I’ve always loved is especially welcoming in the summer! I love how it’s weaved all throughout the house. And the tablescape! 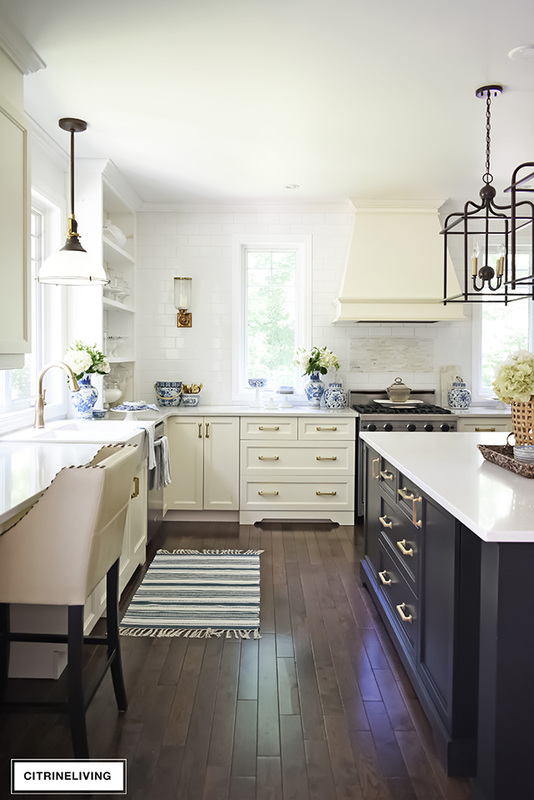 I’m seriously IN LOVE with those blue and white dishes and I’m heading to that post right now to see where you got them! Okay – I am definitely using your runner DIY! So clever and so easy!! Your home looks beautiful (as always), Tam! Love your classic yet fresh style – it is always so inspiriting. Thanks for sharing! Tamara, your home looks gorgeous! 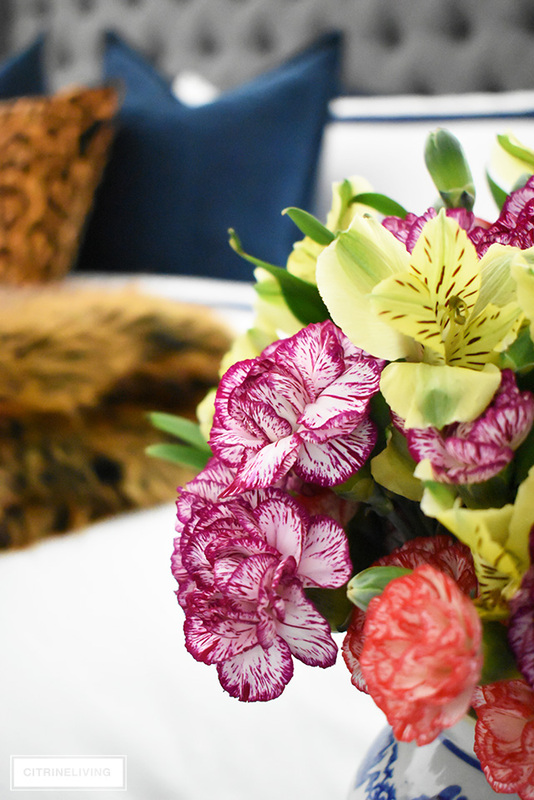 Your causal tablescape is effortlessly styled! Love it all! Ladies thank you very much!! I’m so happy you like it! Muah!! Hi Tamara, I just love your summer tips! Your home looks gorgeous. I especially love how beautifully you have used and mixed patterns and stripes….beautiful! Thank you Joan! I’m on a stripe kick lately that’s for sure! I have a million striped things in my closet and you’d think I’d have more around our home! Im obsessed now lol! Tamara, it’s pretty amazing! 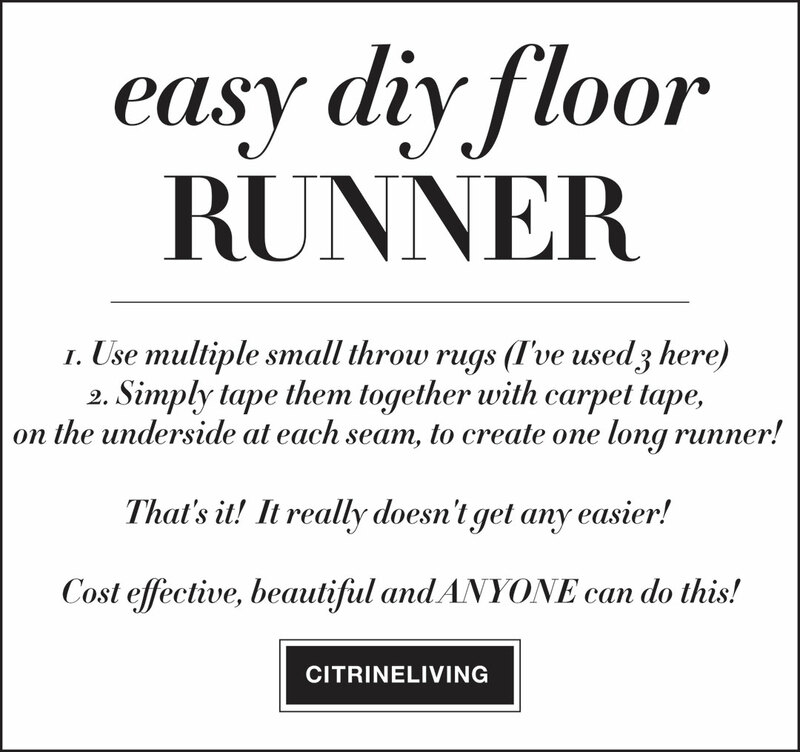 Love the idea of taping the rugs together to make runners! 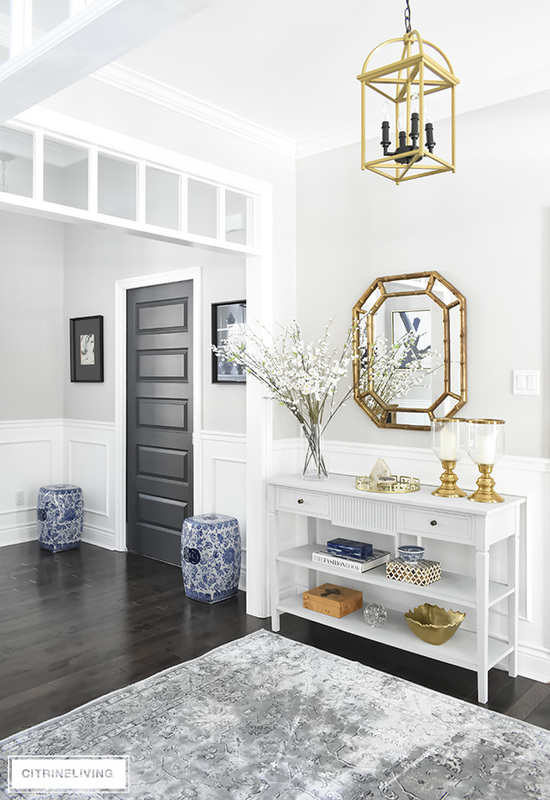 Your home always looks so crisp, patterned, and classic! Love what you do, every time! Amy thank you so much!! I’ve done that runner trick so many times over the years, I don’t know why I’ve never shared it before! So so easy! Thank you for your sweet words my friend! Laila thank you so much!! I’m in love with the transformation in your home, you have done an incredible job so far, can’t wait to see the rest!! Hi Tamara, could you provide the source for the beautiful framed art pieces on either side of your mantle? Love them ! Dear Tamara, thank you so much for opening your beautiful summer home. I enjoyed to watch and to read it. 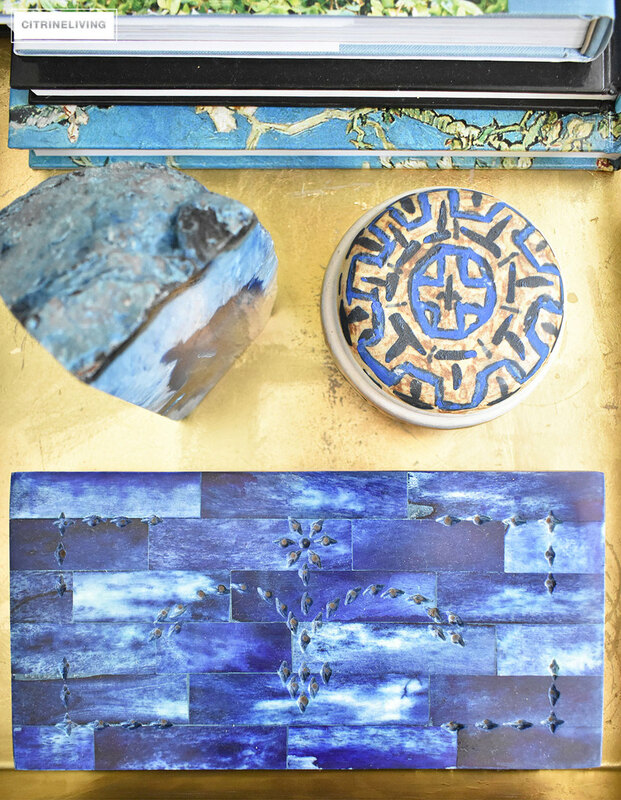 I had “banned” my blue accents but now I’ll go to my attic and have a second look – these shades of blue you are using breath summerfeeling and freshness. But most of all I want to thank you for the trick with the runners. I sorted out the long ones because my washingmachine didn’t love them. Now I know how to create my own ones and can separate them again for washing. So easy, once you know. First time checking out your blog. Your home is truly elegant and also serene. Congrats! !